Jonathan is 14 years old and among the best-performing students in the entire Salama Zone. He was the top student at his primary school at the end of term 1, and he is a member of the top 10 students in his zone. This is especially impressive considering that Jonathan comes from a very humble background. His mother is a day laborer, who takes care of Jonathan’s 5 younger siblings and his ailing father. Jonathan currently lives with his auntie and uncle, who also have their own children to care for. Jonathan has been actively involved in various school clubs and activities. His favorite club is the environmental club, in which he and his club members ensure that seedlings planted around the school grounds are watered and taken care of in spite of the drought. Additionally, his club cleans the school grounds. Jonathan says this club inspired him to pursue a job in the environmental field in the future. Jonathan also likes to read. Recently, he read The River and the Source, on loan from his school’s library. 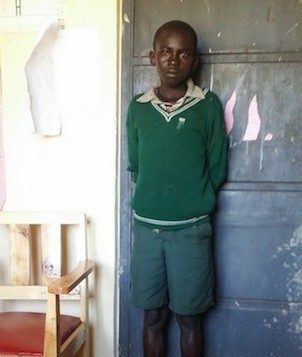 Jonathan needs financial help with paying school fees, and buying his school supplies and personal utilities for secondary school. He also needs moral support to encourage him throughout his academic career. Without this support, Jonathan’s academic star will dwindle, as he has no other way to joining secondary school. Help Jonathan continue his schooling by sponsoring him today!